It has become commonplace. Anyone and everyone who has recorded an appreciable level of success in terms of career or wealth claims to be self- made. Our Rappers have rapped about it and our big men have bragged about it. I have a problem with anyone tagging themselves or being tagged by others as self- made because I don’t believe anyone truly accomplishes anything worthy of note alone. Nobody is a self-made person, millionaire or billionaire as the case maybe…where did we even get the idea that it is humanly possible? The idea behind humanity alone negates the notion of absolute independence. We are interdependent on one another. That’s the way we have been wired by the creator, so nobody can and should claim to have achieved any goal alone. Most of the people who profess to be self-made millionaires say so because they believe they toiled very hard against all odds to be successful in a hard life where the opportunities are few and far between and who can blame them? In a situation where only 0.15% of the world’s population are millionaires, it is somewhat acceptable for these few “lucky” ones to blow their trumpet by way of proclaiming their independent rise to wealth, relevance and recognition. Talk less of the infinitesimal number of billionaires in the world. However, we must remember that our success is not just as a result of our own hard work or persistence. It is the outcome of the combined efforts of other people behind the scene who have in one way or the other contributed to our lives either by way of influencing us positively to pursue our passion or giving us the opportunity to express ourselves just when we needed it most. Even the richest people in the world cannot claim to have amassed their wealth solely by the own efforts. A look at the lives of Bill Gates, Oprah Winfrey and our own Aliko Dangote reveals that they were all given opportunities at a time in their lives which served as stepping stones for their outstanding success story. Bill Gates was excused from Math classes to pursue his interest in programming at age 13. He also got his parents support when he decided to drop out of Harvard to start his own company. Would it then be right to say that his Teacher, parents and even his business partner Paul Allen were not part of his success story? Oprah Winfrey who has been dubbed the richest African-American of the 20th century and greatest black philanthropist in American history acknowledged her grandmother’s influence by encouraging her to speak in public and giving her a positive sense of self. Her story can not also be told without mentioning Dennis Swanson, the man who gave her a job in radio while still in high school, making her the youngest and black female news anchor at that time. Aliko Dangote who is currently the richest man in Africa and ranked the 23rd richest person in the world by Forbes magazine borrowed N500,000 from his Uncle at the age of 21 to start his business. Surely, he cannot talk about his wealth today without paying tribute to the man who believed in him. Even the current wealthiest man in the world Carlos Slim was introduced into the world of business by his father at a very early age. Celebrities are famous because the public chose to give them special recognition, without the average man on the street who asks for an autograph or photograph and attends their concert or movie premieres, they would just be like everybody else. The Adenugas and Dangotes of this world would be at best very comfortable men if you and I didn’t buy into their companies. Beyond being regarded as wealthy or famous, even those who are at the peak of their professions or careers couldn’t have achieved that feat without someone providing the platform for them to prove themselves. If I didn’t have anyone reading my articles on this blog, then who am I writing for? If you believe you have done it all alone, think again…someone somewhere must have influenced or encouraged you in one way or the other. And suppose you just stumbled upon a bag a cash in the woods with no one in sight to claim it, providence orchestrated that not you. Those who profess to be self-made men are either ignorant or arrogant. 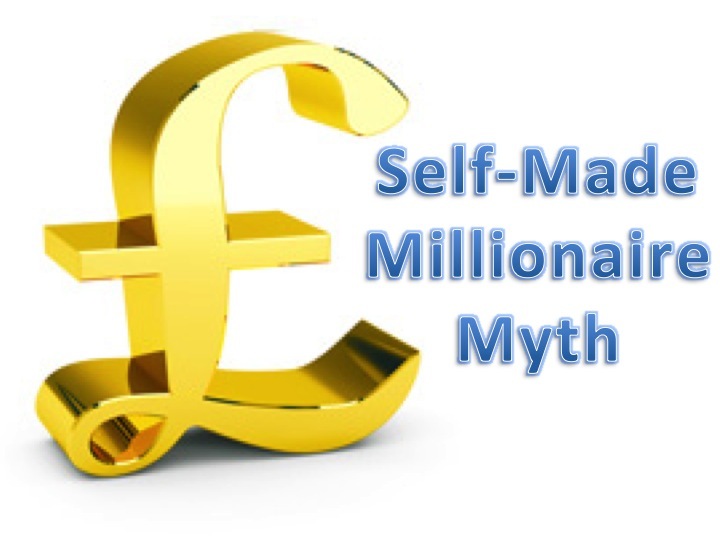 The self- made millionaire syndrome is a myth. Nobody makes it alone. Nobody. I am not denying the struggles that anyone went through to get to the top but I still think it’s wrong for them to claim to be self-made. I understand that when someone has suffered so much though, when he eventually does “make it”, he is no mood to ascribe his feat to anyone. But then again…. thanks Babatunde. Well said lolade. Double thumbs up! Hahahahahahaha. . You are hitting a nerve o Lolo. Tupac rapped; “I’m a self made millionairre. . Thug living outta prison, pistol in the air. .” Others have claimed similar bragging rights and now you have come up to write this?. . How brazzen! Don’t let them catch you ooo. . Lol! Interestingly. . You are absolutely correct on all fronts in your article. I must confess, prior to reading this, I actually believed in the phenomenon although I was always quick to brace it with a caveat; “with God’s grace”. However, drilling it down to the specifics – especially the human angle, it is quite clear that there is no iota of success without a contributory factor from another man. Even if its just simple words of encouragement at the start, it is a reasonable level of influence/contribution and it is usually more than that in most cases. Nobody sure makes it alone. . Even in accomplishing the most frivolous things e.g you need alcohol brewed in the first place before you can get drunk! Nice piece as usual Lolade. Kudos! Lool, (I actually had that “Hit ’em up” track by Tupac in mind when I wrote that Rapper part). Thanks a lot Abayomi, you have just buttressed my point. Of course, God is the no 1 factor in any man’s success, but God will most likely use man in helping us achieve our goals. This is very true, no one is self made in this life. You where only able to maximise an opportunity given to you or the one you seize from those who couldn’t see the opportunity. Well said Yemi. Thank you. You are very Right Lolo. The more we live with this reality the more we learn to be humble, selfless and willing to Give people a chance. There are people who say they want to be self made only to reject support or help from people..
Well…Unfortunately for them, they can’t be self-made whether they admit it or not. Thanks sir. Some people say it out of ignorance too. They hear almost every other successful person saying it. Thanks Anwuli. Nice piece! The least paid and often ignored staff is also a part of the success story of these millionaires! Sad but good point made Jola. Thank you.